Iris mini is free and minimalistic version of Iris. This is the entire Iris mini, no UI, no buttons, no many confusing options. Iris mini is software for eye protection. It can reduce the color temperature of the screen and it can also reduce the screen brightness without increasing the flicker rate of the monitor (the so-called PWM problem). Think of color temperature like decreasing the blue light emitted from the screen. At night the blue light stops the secretion of melatonin, the hormone responsible for our sleep. What Iris mini does at night is that based on your location it makes your screen a little more yellow or red depending on the value of the color temperature. This is like other softwares f.lux, Night Shift and other blue light blocking softwares. The other cool thing is about the brightness. When your monitor is working it flickers all the time. This flicker is usually at a really high frequency and we don’t detect it. There is no way to make monitor without this flicker and this is not the actual problem. The problem is that most monitor makers control the brightness with decreasing this flicker rate (the so-called Pulse Width Modulation). And the lower the frequency the worse for our eyes. This is the reason you feel eye pain, headaches and other problems from the PC. Well, Iris mini can change the brightness without decreasing the flicker frequency which is really cool. Iris mini has 3 modes which you can change by left clicking the icon (this blue icon above). Automatic mode: During the day color temperature will be 5000K and 100% brightness and at night this will change to 3400K and 80% brightness. Manual mode: Use 3400K and 80% brightness all the time. Paused: Iris is paused and does not apply color changes. The K values are color temperature. What this means is that the lower K means less blue light. Less blue light means you will get better sleep and less eye strain. How? Read the article about Color temperature. The % values are brightness. This are luminance values, but innovative without PWM flicker. Basically this also helps your eyes hurt less. For more information check the Brightness article. For most human beings the automatic presets and values are completely fine, but you know you and I are not normal, we want customization. Iris mini has option to get more values with its Pro version. You can get the Pro version for $8. It’s one-time payment like for Iris. You can read more about licensing from the Licensing page or buy Iris mini Pro from the Buy page. There are also hidden features in the Pro version if you need even more customization. 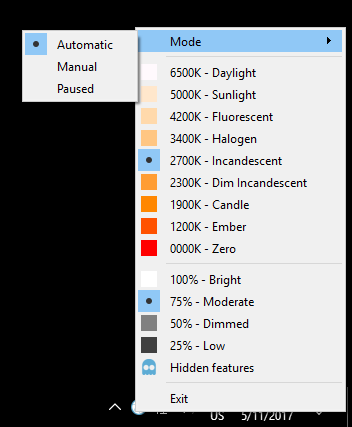 For example, there is a way to set Temperature to 200K or 9000K and brightness to 63% or as low as 20%. You can buy Iris mini Pro from the Buy page. If you have any problems, check the help article about Iris mini or contact me.